Just a few years ago, yogurt production was taking off inside a Town of Batavia business park. Alpina Foods opened a production plant in 2012 in the Genesee Valley Agri-Business Park. The following year came the debut of the neighboring $206 million Muller Quaker Dairy plant, a joint venture of PepsiCo and the Theo Muller Group. Hopes were high for the yogurt industry in Genesee County, fueled in part by consumers' increasing appetite for Greek yogurt. The industry's growth was also good news for upstate dairy farmers, generating demand for their milk. The Muller Quaker plant closed in late 2015, eliminating more than 170 jobs. And the Alpina plant just shut down, with about 35 employees. 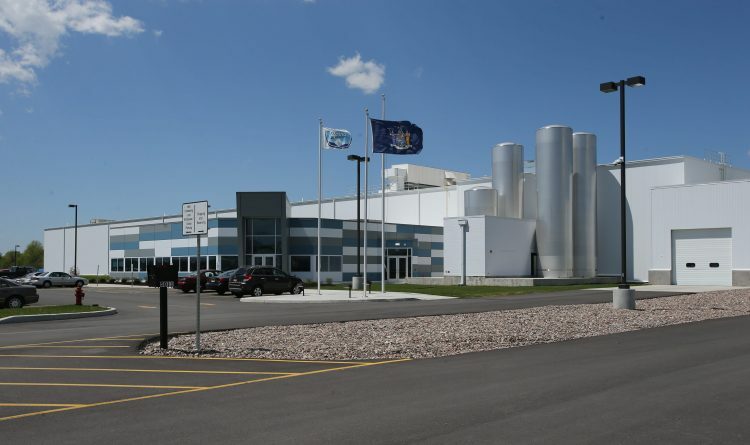 Steven Hyde, president and CEO of the Genesee County Economic Development Center, was at the forefront of efforts to attract Alpina and Muller Quaker Dairy to the newly developed business park. "To have them go away is certainly a disappointment," Hyde said. While those two yogurt ventures went sour, local economic development officials are looking to what comes next. 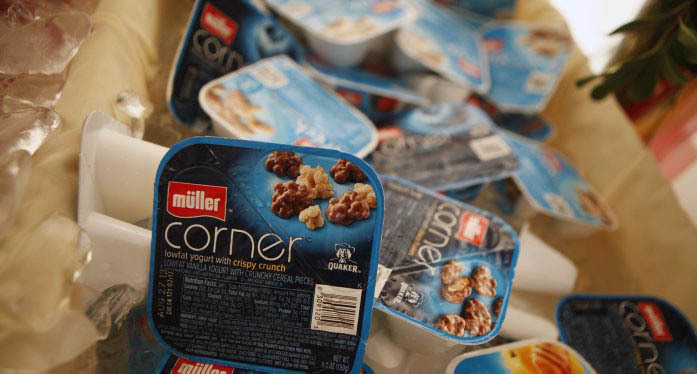 Muller Quaker's former plant is being revived by another company, HP Hood, which has said it hopes to have 230 people working at the facility - more than Muller Quaker Dairy had when it closed. A firm marketing the former Alpina plant for sale said it has already seen strong interest in the property. Another yogurt maker moving in seems among the possibilities. Hyde said both companies left behind strong assets, in the form of modern plants that are well suited for the agricultural industry, particularly dairy processing. 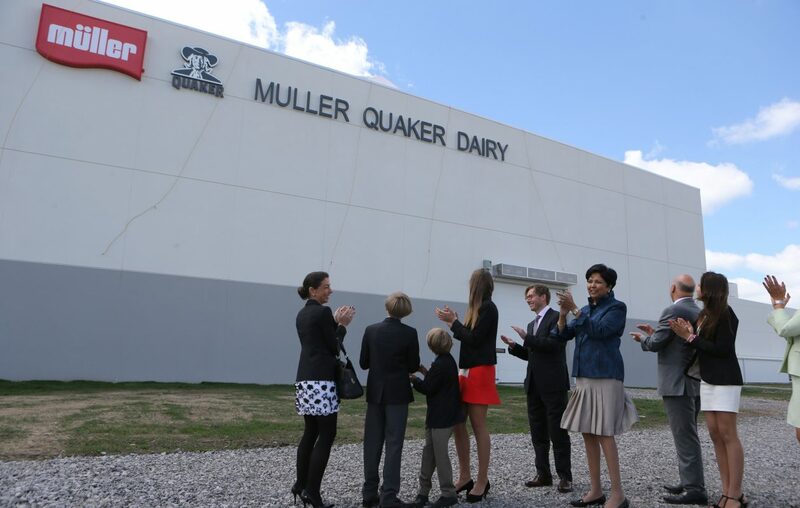 The Muller Quaker Dairy plant appeared to have solid prospects when it opened its doors in 2013, with the backing of Pepsi and Luxembourg-based Theo Muller Group. Pepsi's then-CEO, Indra Nooyi, attended a dedication ceremony and hailed Pepsi's move into yogurt as a "perfectly logical" step for a company with other snack foods in its portfolio. "This is the anchor plant," Nooyi said in 2012. "This has to be successful for our whole push into protein to be successful." The state celebrated the yogurt industry's boom times. From 2007 to 2012, the state's yogurt plants boomed, tripling their production. New York state in 2012 surpassed California as the nation's leading yogurt producer, and convened its first "yogurt summit." Yogurt was designated the official state snack in 2014. But the industry's growth slowed in recent years. Yogurt production in the state peaked in 2013, at 742.6 million pounds, and has plateaued, according to statistics from the State Department of Agriculture and Markets. The total yogurt production statewide for 2017 was about 700.3 million pounds, down about 6 percent from the peak. A Packaged Facts report on the national yogurt industry, released in early 2018, said sales of Greek yogurt slowed as the segment matured. "The overall market has suffered since the underlying declines for traditional yogurt haven’t been offset as they previously were by the significant growth in the Greek segment," the report said. “It was mutually agreed … to be in our best interests to exit the joint venture,” a spokesman said then. For such a high-profile venture, it was an unexpected blow to the region. The Dairy Farmers of America stepped in to buy the Batavia plant, to ensure it would remain active in the dairy industry. The plant was then sold to HP Hood, a Massachusetts-based company that started operations late last year, making "extended shelf-life beverages." "I expect we'll have similar opportunities with the Alpina facility to keep that in dairy processing, as well," Hyde said. Harry Davis and Co., an auction and appraisal service based in the Pittsburgh area, promotes the former Alpina property as an "ultra-modern yogurt facility." "Our goal is to bring the jobs back to the plant, and more of them," said Aaron Morgenstern, Harry Davis and Co.'s managing director. Alpina declined to reveal the asking price for the property, which includes a 40,000-square-foot plant on 10 acres, high-tech equipment, and 10 adjacent acres that the company never developed. Alpina invested an estimated $70 million in the facility over the years, including for its construction, processing equipment and an expansion that took place on its original footprint. Morgenstern said the former Alpina site has generated interest from "around the globe." Alpina cited the loss of a co-packing contract at the reason for closing its plant, according to the GCEDC. The Colombia-based company had established the Batavia plant as its first U.S. manufacturing operation. Alpina did not respond to a request to comment. The two Batavia operations represented only a portion of the state's yogurt industry. Chobani, which is based in the Southern Tier, was a driving force in the popularity of Greek yogurt. And Dannon is based in Westchester County. Hyde said he viewed the Muller Quaker venture as facing a combination of obstacles that it couldn't overcome. Milk prices were elevated at the time the venture was launching, and Pepsi and the Muller Group faced the challenge of blending two different corporate cultures as efficiently as possible. Plus, he said, Muller Quaker was up against strong competition from the likes of Chobani and Dannon. While Alpina's operation was on a smaller scale, Hyde said the company faced the challenge of establishing itself in the North American market with its new Batavia plant. "It seemed hard for them to get a foothold against what its marketing strategy was," he said. 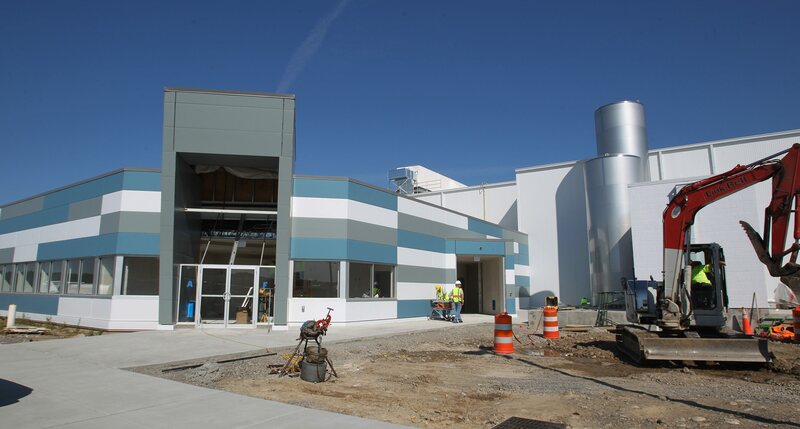 Amid the disappointment of losing Muller Quaker Dairy and Alpina, Hyde said he was upbeat about HP Hood moving to the former Muller Quaker plant, and its growth plans for the facility. Hyde said the HP Hood operation already has about 150 employees as it ramps up. A company representative did not respond to a request to comment, but in 2017 Gov. Andrew Cuomo said HP Hood would invest more than $200 million in the facility and create 230 jobs over a five-year period. And Morgenstern said the former Alpina plant is an attractive property. "We don't see a lot of ultra-modern dairy facilities become available," Morgenstern said. "This is as nice as it comes."